Establish procedures to notify the public of the burn, especially sensitive populations and appropriate authorities. Determine in advance who will be responsible for notification, when notification will occur in relation to the burn, and what media will be used (radio, television, newspapers, posters or flyers, door to door, signage, personal phone calls, etc.). Special attention should be paid to how sensitive populations such as the elderly and asthmatics are notified that burns are being conducted. 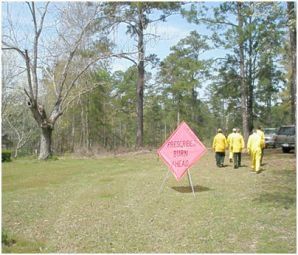 Developing a smoke sensitive distribution list can be helpful in keeping people informed in advance of a burn, during a burn, and in contingency planning should a problem arise.